Congress, APC-led federal government to fund President Muhammadu Buhari’s re-election in 2019. “For posterity sake, I wish to place it on record that I was not among the governors who approved the withdrawal of almost half of our savings in the Excess Crude Account, which belongs to the three tiers of government to fight an already defeated insurgency,” he declared. In a press statement issued in Ado Ekiti on Friday, and signed by his Special Assistant on Public Communications and New Media, Lere Olayinka, Governor Fayose said; “Since they said they have defeated Boko Haram, what else do they need a whopping sum of $1 billion (over N360 billion) for; if not to fund the 2019 elections? The governor also alleged that the N50 billion kept by the Nigeria National Petroleum Corporation (NNPC) in different commercial bank accounts outside the Treasury Single Account (TSA) on the directive of President Buhari’s Chief of Staff, Abba Kyari was part of the fund being kept to fund President Buhari’s election in 2019. 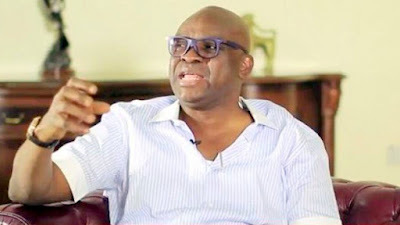 Governor Fayose said, “Nigerians are alarmed by the revelation from the House of Representatives that President Buhari exempted NNPC from transferring N50 billion to the TSA, and the Central Bank of Nigeria (CBN), confirmation that a letter issued by the Chief of Staff (CoS) to the president, Abba Kyari conveyed the directive. “Also, they are miffed by the federal government’s idea of withdrawing $1 billion from the Excess Crude Account to fund an insurgency they said had been defeated.